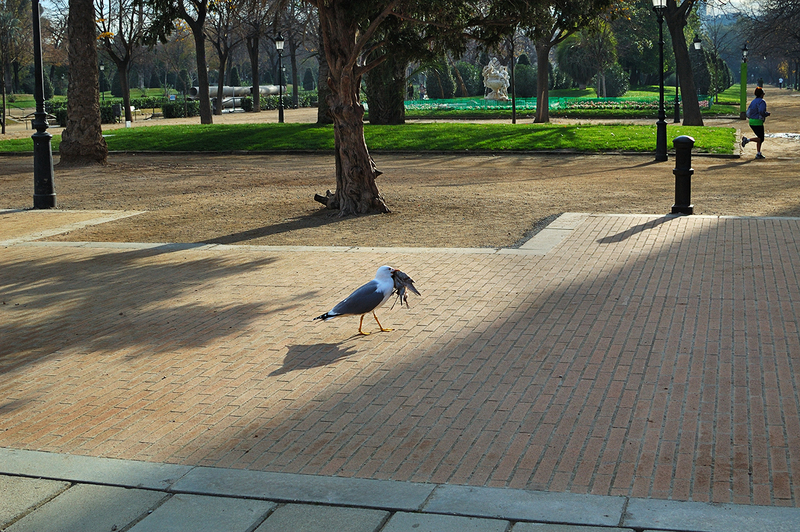 Barcelona Photoblog: Barcelona Predators: Seagulls - Strange Animal Behavior? Barcelona Predators: Seagulls - Strange Animal Behavior? Food, speaking on global terms and not western world standards, is scarce, and this is valid for animals as well that urged by that innate code mother nature gave them tend to change their behavior and even their habitat pushed by this irrational human vicious conduct of throwing stones into our own fragile roof. It is well known that we are happily helping degrade our planet, "nobody lives forever so f*** the future" many think, therefore creatures of the earth find it hard to survive in such a mess. Who has not heard of thinner than ever polar bears coming into towns for food, birds not migrating when or where they are supposed to, insignificant fish captures due to drastic changes in ocean temperatures as a result of global warming of the planet caused by men. I remember those times, when a seagull used to be near the shore feeding on fish or crabs and carrying their prey to their nests in nearby hills. In Barcelona it has become rather common to see these noisy, cunning and robust birds nesting on the roof of our buildings, claiming their territory against pigeons and smaller species and in some cases attacking children in school backyards to steal away a sandwich. Seagulls are carnivores and sometimes scavenge a little so it is not strange that they kill a small sick bird or take profit from their decaying corpse. The ackward thing to me is to find it in the middle of the Ciutadella park surrounded by people, holding an animal so big as an adult pigeon and looking at me so defiantly in the most pure Hitchcock-The Birds style. Times are achanging my friend and for the bad. I hope that is a pigeon in its mouth because I hate pigeons more than seagulls. Matar para vivir. Los humanos tampoco estamos escapando a ese dilema. Muy buenas las últimas fotos, Carlos. Me ha gustado especialmente el texto con el que acompañas la imagen de hoy. It took seeing it, to believe it. La evolució de les gavines i gavians està duent-los a ser els nous rapinyaires. El bec ja el tenen ben adaptat però els hi falten les urpes. A les viles pescadores ja no s'hi veuen coloms. Els cacen. Ja veurem si les gavines invaeixen també Barcelona capital i deixarem de veure-hi coloms roquers per veure gavines i gavians. El otro dia estuve paseando por el parc de la ciudadela, bonito lugar lleno de detadelles para fotografiar.